A MAJOR four-band gig, including a farewell performance by the popular Exodus, is to take place at Polesworth School on November 12. Other bands on the bill are Spirit of Water, Cosmic Emotion and Corrupt Youth. Brothers Geoff and Dylan Haddon, of Exodus will be making two appearances at the gig, for they have each joined different bands. Geoff has teamed up with his other brother Steve in Spirit of Water, while Dylan has formed Cosmic Emotion. Spirit of Water also includes Terry Smith and Paul Lewis. Steve Wallbank, Chris Price and Richard Banks will be joining Geoff and Dylan for Exodus’ final performance. Looks like a great gig in store. Make sure you get there. 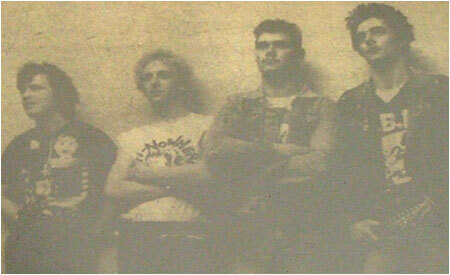 Caption: North Warwickshire punk band Corrupt Youth part of a four-band line-up.